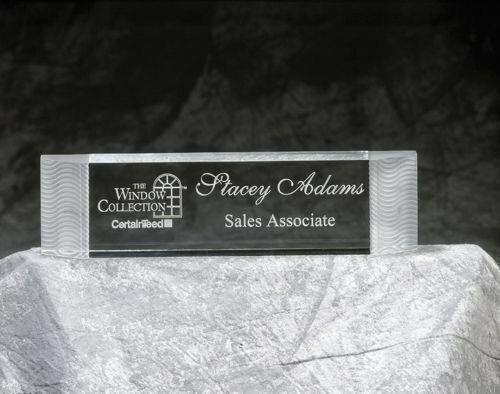 Present the Frosted Edge Acrylic Desk Bar as a gift or to recognize a new promotion.This acrylic award is laser engraved creating a uniquely beautiful award. Present the Frosted Wave Acrylic Desk Bar as a gift or to recognize a new promotion.This acrylic award is laser engraved creating a uniquely beautiful award. 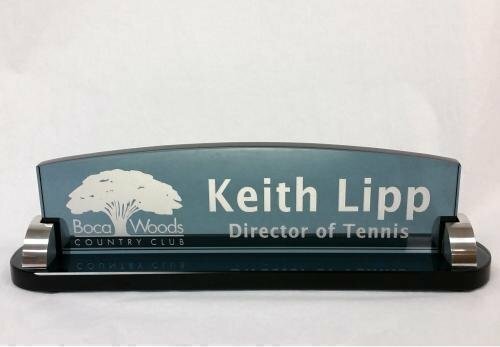 The smoked glass name plate has brushed aluminum accents and makes an excellent corporate or executive gift. It is laser engraved, sandblasted and color filled. Genuine walnut name block desk wedge with black laser engravable plate. A great name block gift for an employee, co-worker or boss. Individually boxed.